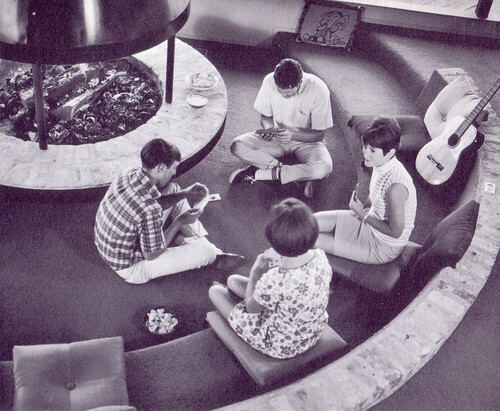 etc., often grouped around a fireplace, where people can gather to talk. 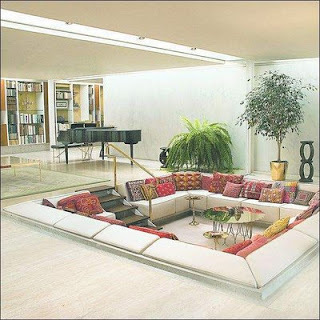 conversation pit in their living room. 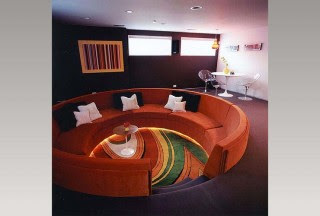 I harbor a huge desire to resurrect the conversation pit. Okay, so your thinking a"shagadellic" Austin Powers, with a heap of pajama clad Hugh Hefner thrown in. My scenario plays like a Bianca Jagger & Halston sharing their inner-most thoughts, while lounging in their jump suits; one or both of them sporting aviator glasses, wearing a neck scarf, and sipping a glass of Möet. Oh yes, many versions were done void of taste and somewhat comical. 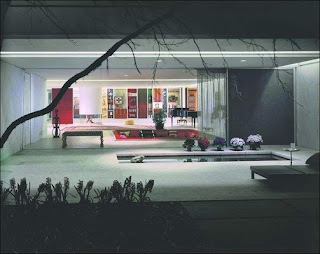 As of yet, I have not found a conversation pit that is more magnificent than the 1957 home of J. Irwin Miller; designed by the great Eero Saarinen, with decorating done by Alexander Girard. It began in the late 1960's outside of Minneapolis. 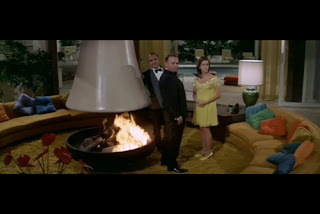 My first recollection of my only Aunt & Uncle's apartment became the launching pad to my admiration of modern design. 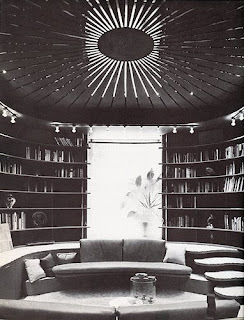 It was furnished with Eero Saarinen’s pedestal table & tulip chairs, an Eames lounger, and a matching pair of black "Wassley" chairs; not to forget the George Nelson bubble light fixture and, although not modern, a swanky black grand piano. After the arrival of their first son, my architect Uncle designed their first family home in the St. Paul burb's. 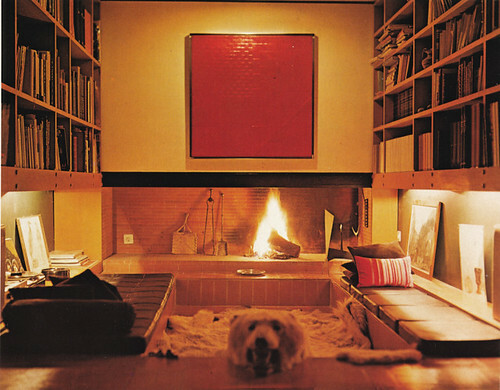 In that home was, and still is, a conversation pit; thus began my love affair with the cool. Per Eileen Daspin with the Wall Street Journal - Home builders such as D.R. 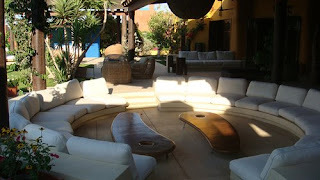 Horton & Toll Brothers are now introducing the 'pit's' direct cousin to it's new home line up - the sunken living room. A Wisconsin builder recently polled the number of homebuyers who would prefer a sunken living room and the result was a surprising 60%. Sunken living rooms create great vantage points for watching television in today's vast "great - rooms" allowing unrestricted views for those also in a dining room and/or kitchen.The sunken space also breaks up these over=sized rooms, and greats instant character where often there is lack of architecture. Although cost prohibitive to add a sunken space to an existing home; under-construction home additions can cost (depending on size) $1200. to $10,000. Fear safety issues? The WSJ goes on to say that when home buyers hesitate to jump into buying a pit, it is usually because they are worried they could trip, a la Mr. Van Dyke, on the step down. Still, Sarasota, Fla., builder Brian Pruett says active baby boomers are overcoming the fear of falling. "Years ago, Florida used to be the shuffleboard capital of the world," he says. "Now you've got retirees playing tennis into their eighties. It's not a big deal walking up two steps." 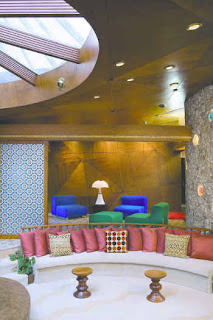 Cropping up from one coast to the other, in some of the newest & chicest boutique hotels, the sunken conversation area continues to create intimate seating for casual, comfortable conversations in modern times where face to face communication is becoming a lost art. Would you converse or better contemplate a conversation pit of your own? 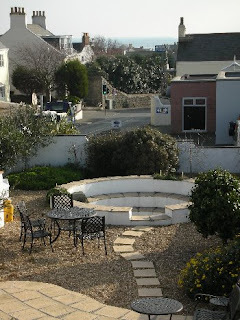 What a fabulous post DT! I love it. I would love to have a pit in my house - how cool that your Uncle's house has one. Do they still live in it? You should post a picture of that one! Dublin is on my list of places to go - so I'm bookmarking that Number 31 hotel - it looks fabulous. Fun photos, great text! Loved it! Makes for quite a dramatic look. In florida we had a sunk-in living room, but only by a few inches. Hello Deb, thanks for stopping by my cottage, for the lovely comment you left and for joining my followers. I am here for a visit too and I also like what I see. Just reading your profile took me back many years to better days and fond memories. I have placed a link to your site on my through beau-TEA-ful people which is a site on my profile. Please stop by again, I would love to see you. We just spent a weekend w/ your uncle (my father-in-law) in the twin cities. Our 2-year-old only fell into the pit twice! It really is a neat and cozy way for the famiy to be together (and serves as a great play pen for little ones)! The best story was years ago when our pug was a puppy, she was running around like a maniac...she didn't realize the pit was there, ran directly over it...and there she was, stopped in mid air, legs running like mad, and then...drop. We laughed til we cried. 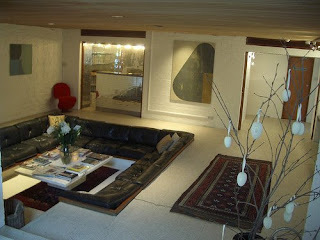 I'm all for the ressurection of the conversation pit. Let's start a fad. Love the pictures you have shown. Great post, I've thought pit's were interesting, I love the pictured one at the Hemple in London. How cool is that! Your've sure picked out some interesting ones there! So not the pits...these pits are all so fun. I would love to have a pit for a fondue party. I really like the backyard pit! Nice blog, however the Irwin home is in Columbus, INDIANA not Ohio and the home now belongs to the Indianapolis Museum of Art. My in-laws have one at their place. 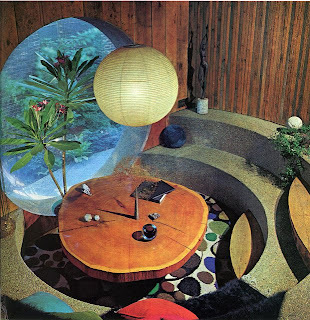 They have a very 70's home, with green carpet and everything. 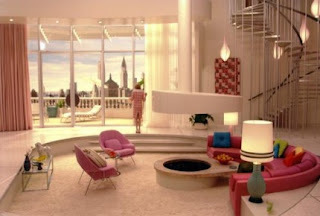 But I Love their Conversation pit. 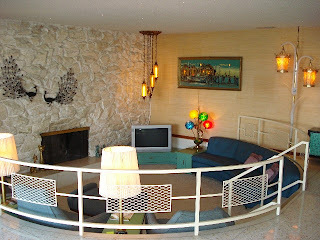 I would love to just revamp the whole house, update the furniture and flooring, and totally revitalize that 70s-looking converstion pit. Many thanks Ruth for correcting the state in which I had the lovely Miller located. I also included that the Indianapolis Museum of Art as it's owner. I appreciate your comments & thank you for visiting my blog.What a huge privilege & responsibility you have as the Museum's Coordinator of Rights & Reproductions. I'm glad that I could make you laugh today! To answer your question, YES! I am a native Texan! I would not have it any other way. I do love it here; although, I HATE the 100+ heat we have been having. Things are much calmer and quieter today. I hope you have a super fantastic weekend! I would totally rock the pit!!! My parents got rid of theirs in Maui & I almost cried...too cool & now gone!!! I've always loved the idea of a cozy spot. I think it may elevate the art of just sitting around & yakking with people. 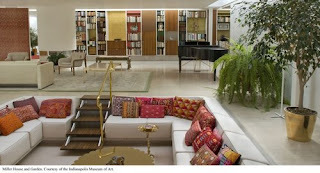 I love the Miller house very uber chic!!! I'm also in love with your aunt & uncles furniture collection. Be very sweet to hthem, wink, wink!!! I hope your other Alicia's little one is okay, but the pug story is priceless. I would give my right arm for any of those pits!